These facts might paint the artist as being more conservative than others of his generation. Conceptual artists were famous for their information-heavy, language-based approaches, which drew from science, mathematics, and sociology, among other disciplines, but LeWitt insisted that his work was irrational and absurd, even in spite of the clarity of the written instructions for executing his pieces. What makes him radical, perhaps, was his openness, the way he achieved a kind of Zen freedom in his perspective on not only making art but also living life. 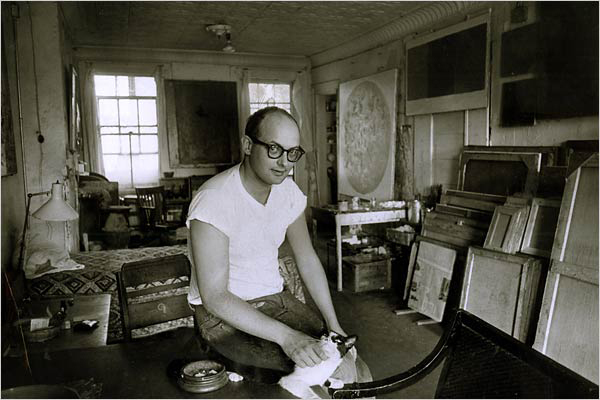 Famously generous for trading artworks with almost anyone and for being an all-around great guy, the artist might be publicly acclaimed as Saint LeWitt—if only he weren’t Jewish. The art historian and curator Brenda Richardson called this approach “an almost unimaginably radical act that dramatically influenced the evolution and sequential redefinitions of art over subsequent decades.” Certainly decorating the surfaces of walls with pigment or ink, as seen in cave paintings, Renaissance frescoes, and modern murals, is among the oldest, most venerable forms of art. Richardson’s argument, however, largely emphasizes the ephemeral nature of LeWitt’s work (“just paint it out”), its obliviousness to commercial concerns, and the removal of the artist’s hand, that is to say, anyone with the instructions can re-create a work by LeWitt. Of course one could find examples of such conditions throughout the history of art, but that’s beside the point here—dematerialization was all the rage in the late sixties. Reynolds asked his three colleagues at the table about their experiences with LeWitt’s work. He had first encountered it himself in the 1970s at the San Francisco Museum of Modern Art, which had exhibited Wall Drawing #260 (1975), a piece now in the collection of the Museum of Modern Art in New York, where the panelist Ann Temkin is chief curator of painting and sculpture. Previously Temkin spent thirteen years at the Philadelphia Museum of Art, which owns and displays a work called On a Blue Ceiling, Eight Geometric Figures: Circle, Trapezoid, Parallelogram, Rectangle, Square, Triangle, Right Triangle, X (Wall Drawing No. 351) from 1981, which was installed a year later on a barrel-vault ceiling in the modern-art wing of the museum’s enormous beaux-art building. During her thirteen years at the museum, she said, this work complemented everything that had ever hung below it. Reynolds agreed, saying that LeWitt was brilliant at placing his art inside buildings. He should know, since he organized a retrospective of wall drawings in 1993 at the Addison Gallery of American Art, where workers created forty-four drawings in ninety days for an exhibition that was up for only two months. Reynolds is also the man responsible for the twenty-five-year exhibition Sol LeWitt: A Wall Drawing Retrospective at the Massachusetts Museum of Contemporary Art (MASS MoCA), on view through 2033. 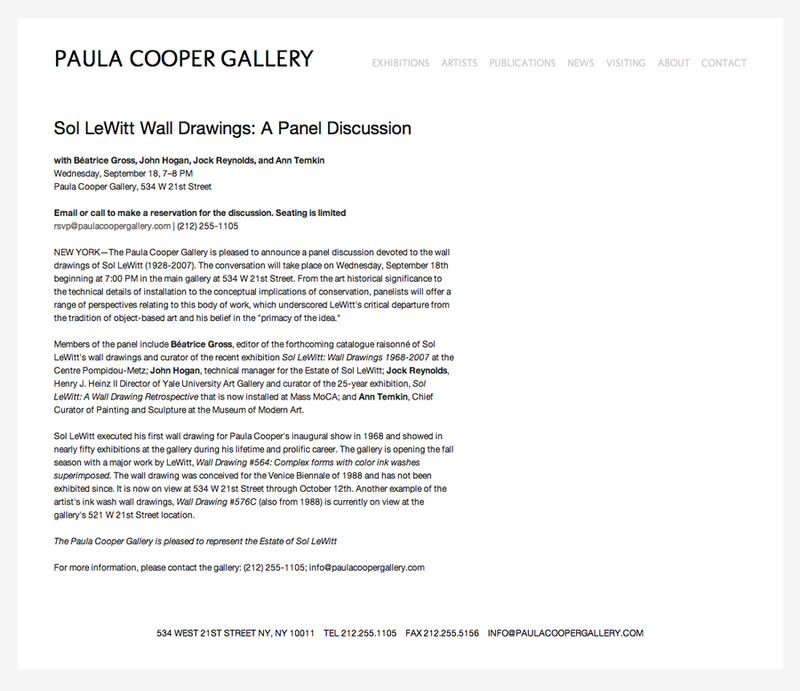 John Hogan, the technical manager for the Estate of Sol LeWitt who oversees the creation of new wall drawings—including the Paula Cooper show—first heard of his former boss when he, as a young artist in Chicago, became intrigued by a type of art that could move around the world in an envelope, which to him was a political gesture. Hogan recalled that during all the years he had worked for LeWitt, the artist never scolded a wall drawer by saying “you’re doing it wrong.” Instead LeWitt told that person that he or she didn’t comprehend or understand the work. I’m not quite sure exactly what the difference is. Hogan relayed how his assistants, from high schoolers to professional artists, love doing the job: for the ideas, for the travel, and for the employment—LeWitt was apparently generous with wages. Thousands of people have realized wall drawings over the past forty-five years, Reynolds noted, and some of the “wrecking crew” that made Wall Drawing #564 sat in the front row of the audience. Reynolds even asked one of them, Krysten Koehn, to say a few words. She had joined the team as an MFA student in the Yale School of Art and explained the respect and appreciation she now has for the intimate nature of LeWitt’s work. Her own art, she revealed, had become more idea and processed based as a result. Later Reynolds would similarly call on Erica DiBenedetto, who as a graduate student helped organize The ABCDs of Sol LeWitt at the Williams College Museum of Art in 2008–9, to describe her curatorial experience. Who would Reynolds put on the spot next? The clarity of LeWitt’s straightforward instructions, Hogan emphasized, belies the dedicated work needed to execute a piece. Everyone draws an “unstraight line” in a different way, he said, but a certain quality of line, color, and discipline is expected. Agreeing with Hogan, Reynolds said the idea, hand, and eye must work in tandem. Even though the artist died six years ago his work continues to evolve, Hogan noted. Sometimes artists bring new ideas for materials over time, and sometimes companies stop manufacturing the stuff favored by LeWitt. Nevertheless, he said, “the rendering should be optimum” to better present the idea, from straight lines to the crystalline facets produced by myriad triangular and pyramidal forms, as demonstrated at Paula Cooper. Béatrice Gross—the editor of a forthcoming digital catalogue raisonné of wall drawings, curator of Sol LeWitt: Wall Drawings 1968–2007 at the Centre Pompidou Metz, and the only panelist never to have met the artist—firmly believed that a new iteration of an older work was not a copy or a reproduction, but rather that the “original” was the inaugural existence or embodiment of the work. Some wall drawings were made twenty-five times, she said, and others not at all. Because LeWitt had a pencil in hand until a week before his death, Gross noted that some of his late “scribbled drawings” had not yet been realized. The multigallery, multifloor installation at MASS MoCA has a few of these, which were dated to 2008 (LeWitt died a year earlier). Reynolds recalled that when visiting this show, the Conceptualist artist Mel Bocher was playfully astounded that his friend had outwitted him, discovering how a person could keep making new work even after passing on. An audience member asked Hogan how the color for the wall drawings is made and how it is communicated. Color choices are programmed, the technician answered, with simple combinations: overlays of red, yellow, and blue inks. At Paula Cooper, certain colors had only one or two combinations, while others had four or five. Regarding implementation, there is “no variable other than the human hand” when workers rub ink-soaked rags or draw hundreds of lines. The tools for making the work, LeWitt had insisted, should not be complicated. Again emphasizing quality, Hogan said the work should be concise and consistent but not clinical. In Terms Of count: 3. Alexander Alberro and Patricia Norvell, eds., Recording Conceptual Art: Early Interviews with Barry, Huebler, Kaltenbach, LeWitt, Morris, Oppenheim, Siegelaub, Smithson, Weiner by Patricia Norvell (Berkeley: University of California Press, 2001), 122. Brenda Richardson, “Unexpected Directions: Sol LeWitt’s Wall Drawings,” Sol LeWitt: A Retrospective, ed. Gary Garrels (San Francisco: San Francisco Museum of Modern Art, in association with Yale University Press, 2000), 37.